Rapturously received at this year’s Cannes Film Festival (where it inexplicably was excluded from the main Competition lineup), Ousmane Sembene’s Moolaade is a surprisingly rousing political film that should be able to win over even those who have their patience tested by African cinema in the past. As much a social comedy as it is a serious protest film, Moolaade focuses explicitly on the power struggle that erupts between men and women when several girls refuse the traditional female circumcision procedure. As it develops, however, the movie takes on additional social relevance, until the matter at hand feels much larger and more complex than the topical subject matter would initially have you believe. 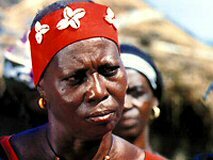 The opening scenes of Moolaade set its plot afoot without sacrificing our ability to understand the rhythms of life in the village in which the film is set. Sembene wastes no time in having the titular curse uttered as a protest to the encroaching circumcision of six young girls, but the villagers react to its incantation with the bemused annoyance with which tradition is usually greeted. A drum echoes throughout the town, alerting the villagers of the curse, but when one man learns the reason behind the drumming, he describes the Moolaade as “a minor domestic issue”. Things naturally escalate from there, into violence and rebellion, but the movie never leaves behind its directness of intent, even as it begins to complicate the issues beyond a simple clash of genders. 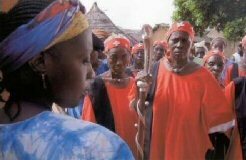 The prime achievement of Moolaade is the tone, which always remains resilient and proud, even in the face of death and mutilation. Feminine empowerment here is initially inspired by the messages heard on the radios that the town’s women treasure, but it grows naturally from that seed, out of their own lives’ circumstances, in a way that suggests it’s much more than a fashionable move (the close-ups of an ancient ostrich egg at the start and close of the film suggest it’s been a long time coming). Because Sembene helps us to understand the values of these people at the film’s onset, we can better appreciate how those values change. The director makes the legitimate dangers of the ritual (e.g. infection often makes it a deadly undertaking) and the social reasons behind its existence completely clear to the audience, but never can be accused of didacticism. If anything, it’s admirable for demonstrating through its drama, and not its dialog, how groupthink and blind adherence to tradition, can blind one to facts. The one distraction while watching Moolaade is the way that characters repeatedly relay the same piece of exposition to one another. This probably reflects the diffusion of information in such a town, but that's no reason not to edit it down in a film. Inspiring, primal, confrontational, funny, and direct, Moolaade lives up to the hype.